Blood Alley - Blu-ray Review - ReDVDit! Before John Wayne and Lauren Bacall teamed up for his final picture, The Shootist, which would round out Wayne’s legendary career as a film legend in the 70s, they worked together on a now mostly forgotten Warner Bros. picture titled Blood Alley. Bathed in anti-communist ideology, rugged blue collar values, and grandstanding heroism and romance, it carries all of the recognizable traits of a John Wayne classic. The twist? 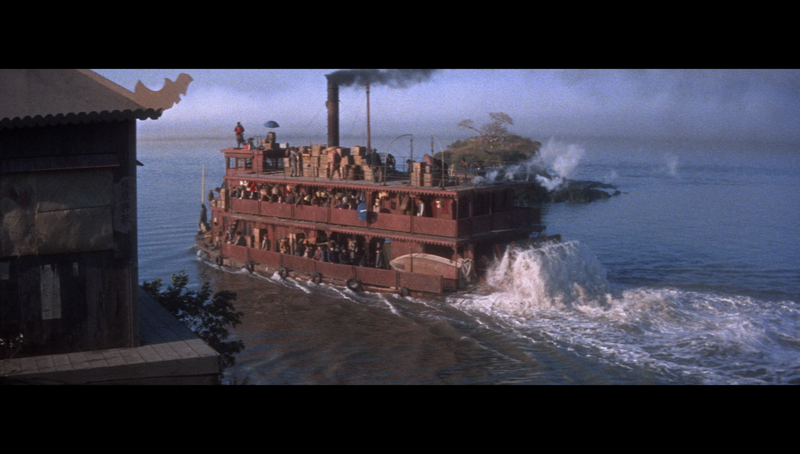 This time it’s set in China, and rather than a gunslinger, Wayne plays a boat captain. Blood Alley is the story of sea boat captain Tom Wilder. An American imprisoned by Chinese communists for two years, he’s helped escaped by the residents of a nearby village. 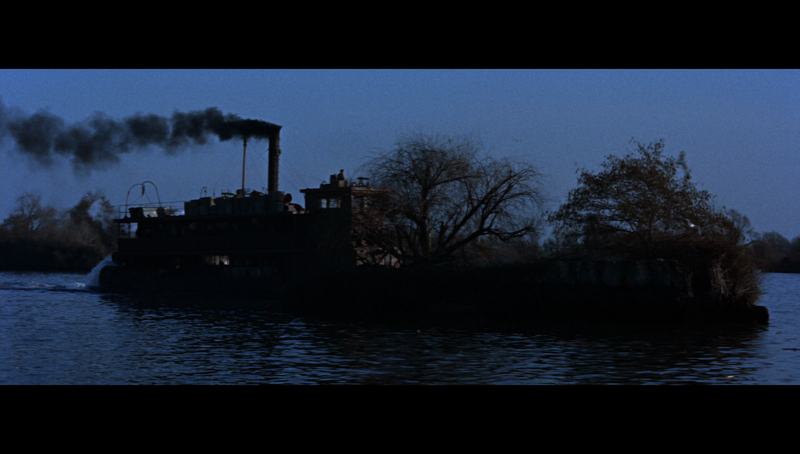 In return for his freedom, they ask him to help them escape to Hong Kong through the nefarious, “Blood Alley.” After aggressive persuasion by fellow American Cathy Grainger, he reluctantly accepts the job and captains a stolen riverboat and together with the leaders of village they devise a plan to escape their Chinese pursuers and seek freedom in the democratic hands of the English. 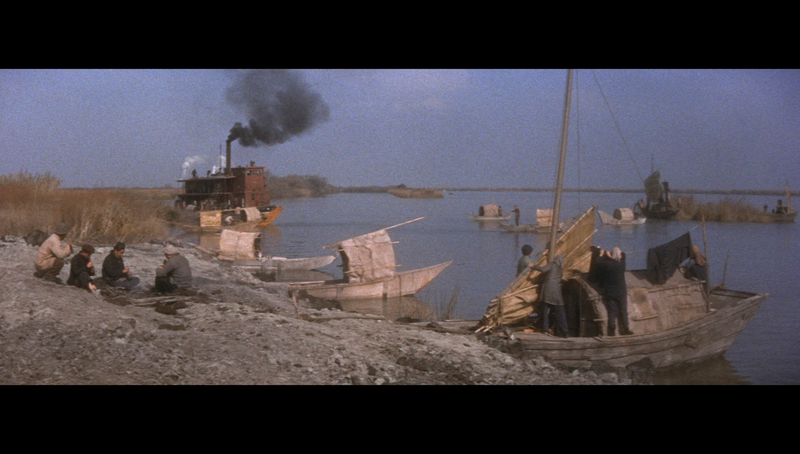 Blood Alley, which was produced by the Duke himself, and directed by William A. Wellman, who is much better known for directing Wings, is basically a western set in the marshes of Southeast Asia. 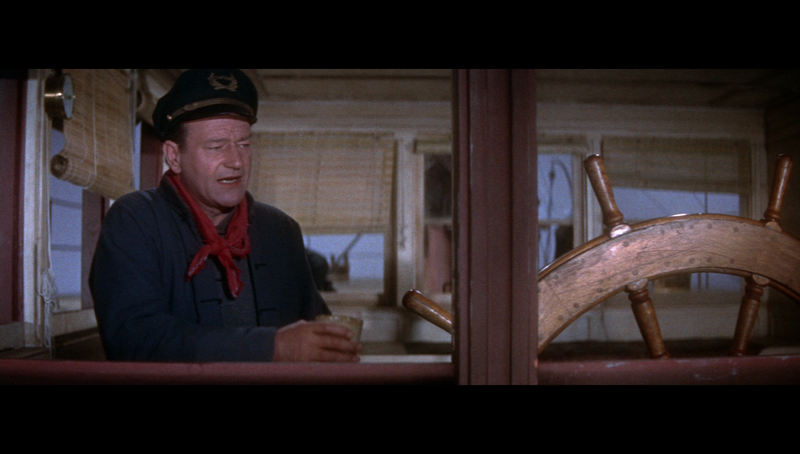 Rather than look to the lone gunslinger for help, the desperate villagers instead turn to John Wayne as a sailboat captain; a reluctant hero, their only hope. He then, over the course of just under two hours commits a number of heroic deeds, performs deeds of ideal masculinity, and even gets the girl along their trip through the nefarious Blood Alley. The only variation tossed into the mix is a quirk in which his character talks to an imaginary woman named, “Baby,” a coping mechanism he used to survive imprisonment by the communists. 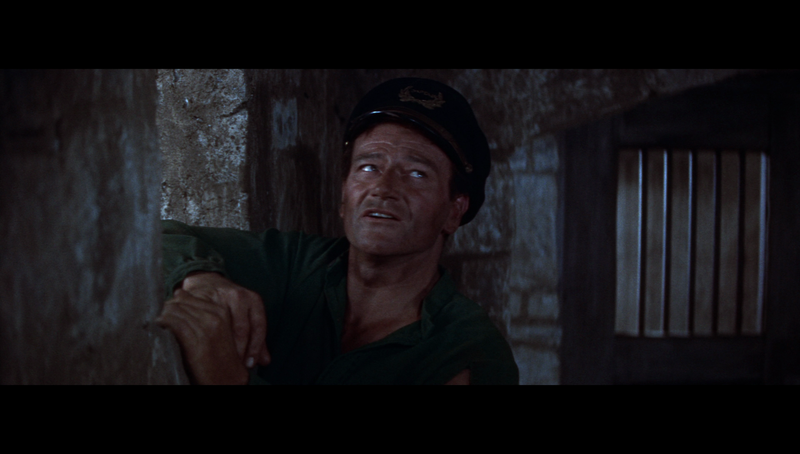 If it was any other actor it’d be a fairly stale performance, but John Wayne plays these kind of roles with such enthusiasm and gusto that its hard not to enjoy such a by the book character that he inhabits. 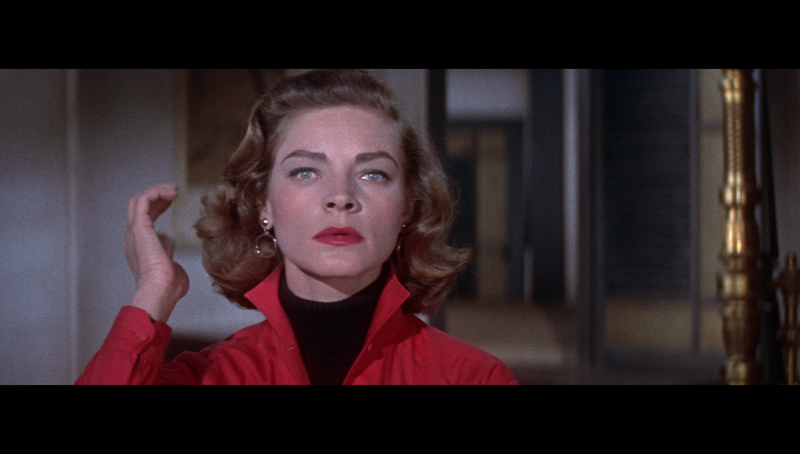 Bacall on the other hand, brings to the table a performance that’s quite unlike anything I’ve seen her in to date. As Cathy Grainger, she’s warm and sultry, but also afraid and alone. Her character clings to the last remnants of her American lifestyle, but also faces the challenges laid out before her with confidence and integrity. She’s a strong woman, but also a physical one; there’s one scene in particular where she’s forced to run through an exploding ship graveyard in particular that Bacall handles with style that really helps enforce her role as a strong feminine lead which balances out Wayne’s overflowing masculinity. Together, their chemistry as lovers isn’t particularly impressive, but as separate characters they act as wonderful foils to each other. The rest of the film’s cast is a mostly authentic ensemble of Asian actors, with a few glaring exceptions such as the leader of the Feng family and a few others who are recognizable faces in makeup to look Asian – hey man, it was the 50s. They’re an entertaining bunch who work together well on screen as a crew and a dedicated village with a cause. Standouts include Mike Mazurki as Big Han, and Henry Nakamura as Tack, the ship’s engineer. These two bring a great deal of humor to an otherwise tense escape from the Chinese communist army. The real star of the film is its wonderful special effects and set design. I mentioned earlier a scene in which Bacall’s character runs through an exploding landscape, but there are also scenes where the boat is under attack, or they use visual trickery to escape from the communists that are bolstered by thrilling practical effects implementations. When Bacall, or more likely her stunt double, runs through the exploding ships, it looks incredibly convincing, a testament to the ageless qualities of many classic special effects sequences. 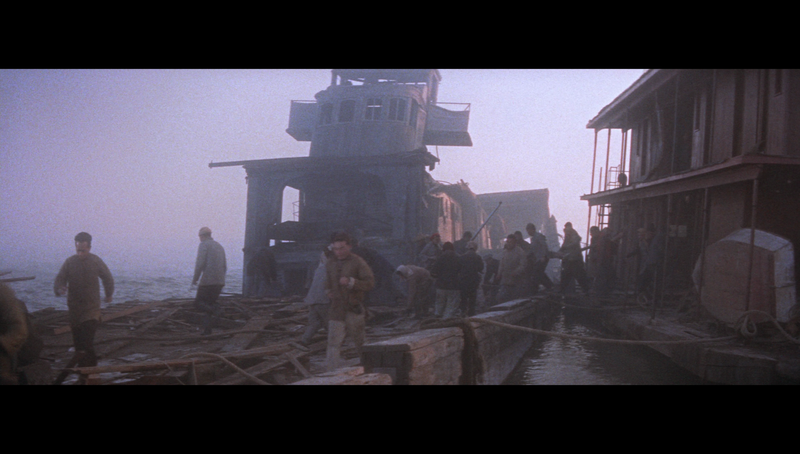 The sets are incredible too, such as the village of Chiku Shan, which is filled with details that make it feel lived in, or the steamboat which becomes crammed to the gills with Chinese culture and ornaments to give it a unique identity that feels authentic to the people that the picture depicts as escaping through Blood Alley. Blood Alley is a fun movie, but doesn’t really add anything substantial to the careers of anyone who was involved with the film. It is chocked full of special effects that have stood the test of time, and is competently acted but it still manages to be a fairly forgettable movie, if not an enjoyable one. It’s a decent way to kill two hours of your time, but failed to leave much of a lasting impression with me as a reviewer outside of a couple scenes. It’s a finely crafted movie, but all it really did was make me want to watch a Wayne western. 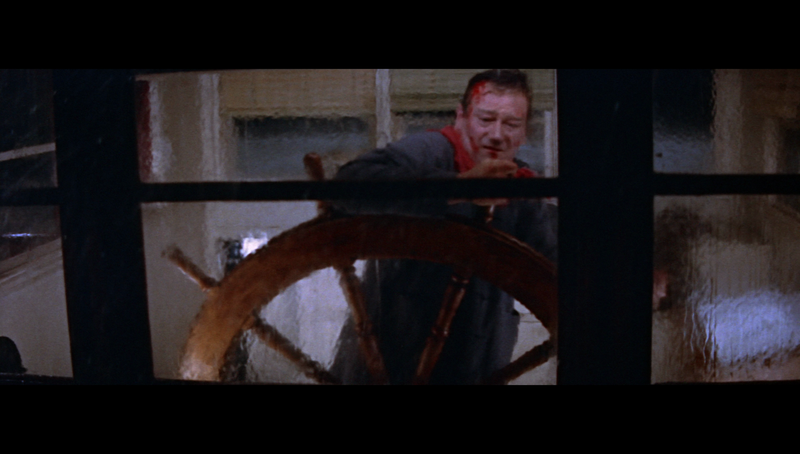 Blood Alley was shot on 4-perf 35mm film with Cinemascope anamorphic lenses, which resulted in a final projected image with a 2.55:1 aspect ratio. The film has been given a brand new HD master by the Warner Archive group and is presented here in 1080p resolution in the original 2.55:1 aspect ratio. I’ve voiced my opinion time and time again on these classic Cinemascope features in terms of their poor resolution of these early anamorphic lenses and somewhat ugly colors due to the early qualities of Kodak single-strip color film negative. Those previous comments stand up here with Blood Alley. I guess even the Duke couldn’t shoot his way out of these technical limitations. Regardless, the Archive always brings their A-game even when the film elements they’re working with don’t. The image is clean as a whistle, and plays back without any stability issues. Primary colors are decent, if not a little heavy on the brown, and detail is muted. The image isn’t particularly sharp, and grain is a bit blotchy at times. I’m almost positive however that we’ll never see a better presentation of Blood Alley though, and what we have here is fairly acceptable, source limitations considered. It’s a solid 1080p transfer of a 50s Cinemascope relic. Blood Alley was originally released to theaters allegedly a 4 channel magnetic stereo mix and mono optical mix on 35mm film prints. It is presented here with a DTS-HD Master Audio 2.0 mono sound mix, recreating the experience that most audiences heard during the film’s original theatrical presentations. Presumably the 4 channel mix is either lost or never existed – IMDB is user sourced after all. Much like the visual presentation, Blood Alley’s mono sound presentation is a fairly average mix. Dialogue, sound effects, and Roy Webb’s musical score are all blended together fairly well. The track is clean and free of any defects. It’s a quality mono track like most delivered by Warner Archive, but don’t expect anything particularly mind blowing. 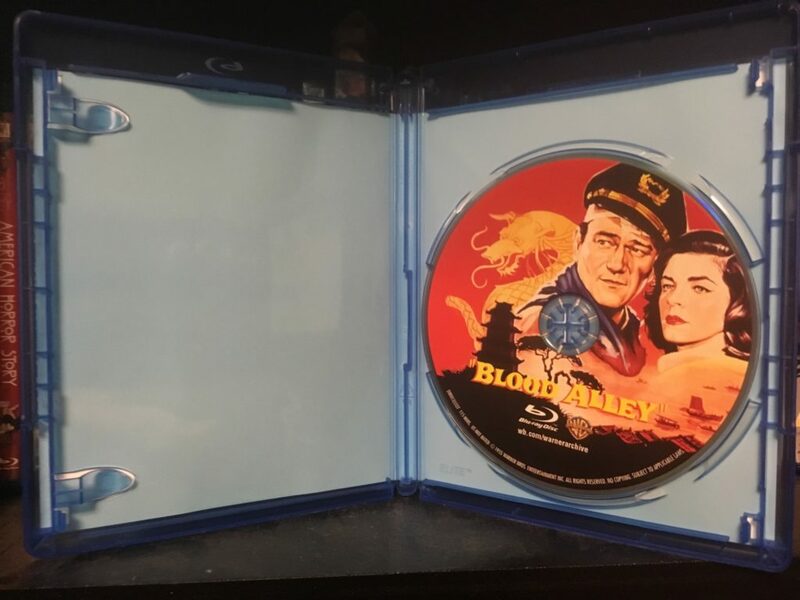 Blood Alley has been released to Blu-ray by Warner Archive in a standard Blu-ray keepcase. The front artwork is a holdover from previous DVD releases of the film, and is a drawing that features Wayne and Bacall in the mid-ground with a dragon in the background and the village of Chiku Shan in the foreground. It’s a detailed, lovely drawing with rich reds and yellows that looks quite good. The back artwork features a sepia-toned picture of a shot from one of the more intense scenes of the film, and a black and white production photo of John Wayne. Next to him is a review quote and a paragraph about the film. Beneath that is a list of features, theatrical credits, and technical specs for the release. Overall a fairly pleasing packaging job from the Archive team. Pathe Newsreel Footage – a reel of multiple clips cut together. Such clips featured are John Wayne being given a Foreign Press award, and Wayne giving a speech about supporting the fight against dictators at the Crusade for Freedom as well as a few other clips about the production of Blood Alley featuring John Wayne and the cast of the film. 1955 Blood Alley Promos – a few promotional clips in which Wayne describes his career and rise to the position of producer, resulting in his producing Bloody Alley. A second clip describes the cameras used to make the film and home video footage from the production set. Trailer – the film’s theatrical trailer, as seen in theaters after films leading up to its release in 1955. The packaging is fairly nice, and the promos are actually pretty interesting in terms of demonstrating just how invested Wayne was in understanding and presenting the way films were made to a general audience. Blood Alley won’t ever be much of a game changer, but with solid special effects and two strong lead performances from two of Hollywood’s most beloved screen legends, it’s a capable action film. 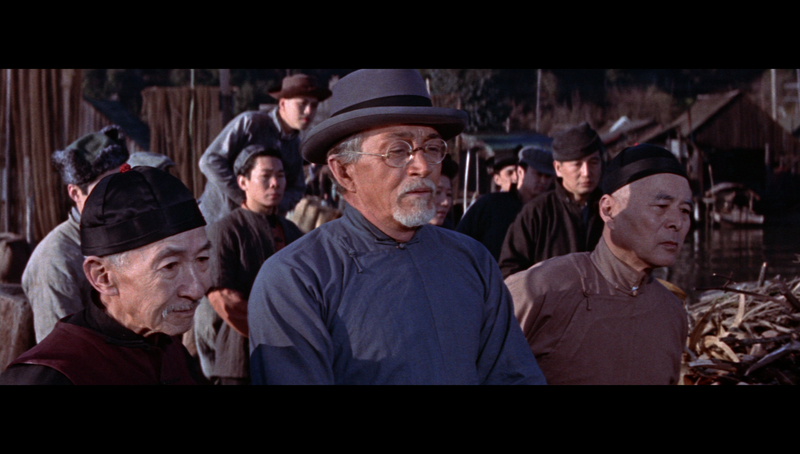 It feels like a safe choice for the Duke to inhabit a role that challenges him so little, but don’t let that stop you from enjoying the adventure that he and the people of Chiku Shan face in their escape from the overbearing hand of the Chinese communists. 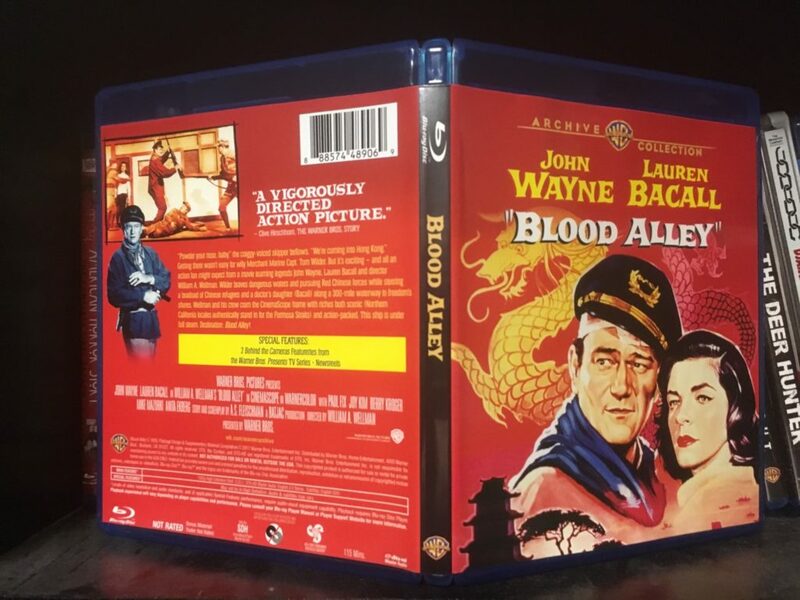 For those who find themselves drawn in by the promise of a Wayne-Bacall fueled spectacle, the Warner Archive group has done a fine job bringing the film to Blu-ray, with a decent 1080p video transfer, a fine mono audio soundtrack, and packaging and extras that more than sweeten the deal.